ENVIRONMENT: Where to now for marine conservation? Would any government be game enough to declare mulloway and kingfich rec only species? AFTER a campaign of concerted opposition, the NSW government has retreated from its proposal to create a Hawkesbury Shelf bio-region marine park by cobbling together 11 existing protected areas with 14 new ones…and banning recreational fishing in some areas within them. You can almost feel sorry for the Coalition Ministers involved. The Labor opposition had on its books a policy for a full-scale marine national park off Sydney and was enthusiastically supported in this by various green groups. The Coalition had its bureaucrats begin a consultation process on a proposal of its own a few years back, but early draft plans showing big lock-out areas were not well received. Somehow, they convinced themselves that a heavily scaled down version made up of 25 small areas would be acceptable. Green groups were, predictably, a bit pleased but said they wanted more. Recreational fishos went ballistic and the government retreated. There’s an election coming and the government is already in damage control…light rail systems that aren’t close to being finished, $500,000 in race prize money donated to the greyhound industry that they previously tried to close, billions on rebuilding stadiums that aren’t very old or run down, freeways that residents hate, horse race promotions on the Opera House sails.the list goes on. But the issue of marine conservation in NSW is not going to disappear. If Labor wins the next election, its policy will re-surface in some form or other. If the Coalition hangs on, it will re-visit the issue, after a decent interval. If it’s a hung parliament, anything’s possible. Given all this, where should rec fishos position themselves in the future? Hopefully not just as opponents of any restrictions on their fishing rights, but perhaps as sensible compromisers who would like to genuinely engage on conservation issues. It’s worked in the past, notably on the protection of known endangered species aggregation sites (grey nurse sharks, black cod) and bait gathering in some intertidal protected areas. So, what are some options for the future that should protect fish stocks? In the case of popular species such as mulloway and yellowtail kingfish where the fisheries scientists are telling us there are real problems, more drastic action is needed. 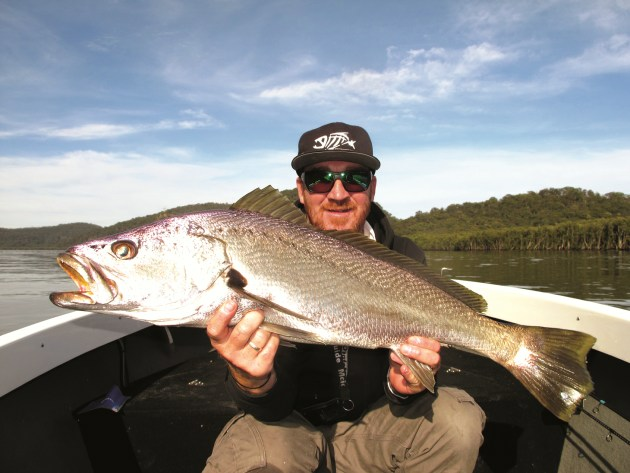 It’s started with mulloway, for reccies at least, with the new one fish bag limit and 70 cm size limit. It needs to go one step further. Make mulloway rec only. No more commercial allocation in NSW. The fish buying public can turn to the very high quality aquacultured product. Sorry, commercial fishers, but for the sake of future fish stocks, you should be out of this game. And the same for kingies: a one-fish bag limit, an 80 cm size limit, and no commercial allocation. Give the measures five years, monitor stock developments, then re-examine. Put in spawning season closures for species where spawning patterns and cycles are known, like luderick, bream, mullet and tailor. Again, monitor effects over time and re-examine. It’s worked for our freshwater cod species and Australian bass. Steps like this also worked in the USA for their drum and snapper species, which aren’t dissimilar to ours, and for marlin as well. Wouldn’t it be refreshing to have politicians and natural resources bureaucrats in NSW game enough to take these sorts of proven successful conservation measures instead of proposing tokenistic lock-outs?